Dip a rice paper into the water, leave for 30 seconds to soften then transfer to board (the paper will continue to soften while you work). Place a couple of mint leaves in centre of paper. Top with some carrot, capsicum, cucumber and spring onion. Add an avocado slice, a couple of cashews and some coriander. Fold ends in then roll up from bottom into a firm roll. Place, seam side down, on a plate and work quickly to make other 11 rolls. 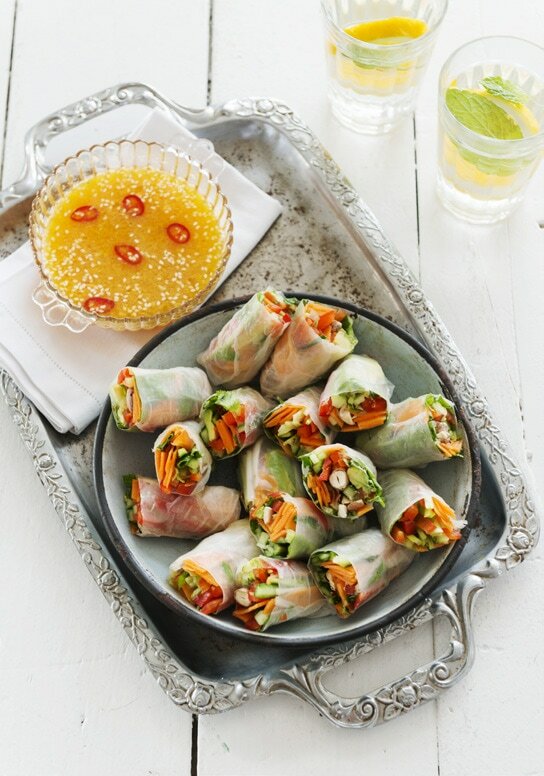 Cut rolls in half and arrange on a plate. Serve with dipping sauce on the side. Tip: ​The rolls can be made a few hours ahead. Dampen paper towels and tuck over rolls then cover with plastic wrap to stop them drying out.